Its lightweight design and portability make it easy to transport and handle (only 25 lb). and loose rock. Our V-Trench standard design blades leave a clean, accessible trench 2.5" wide at the bottom and 4" wide at the top; making it easier to get the job done right! Driven by triple v-belts, the cutter wheel rotates up to 800 rpm for fast, clean cutting. Little Beaver Model No. The Kwik-Trench's compact size lets you get into areas inaccessible to full-size trenchers. 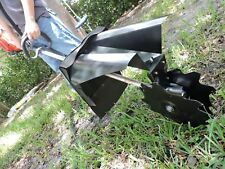 Powerful 15HP Gas Powered Trencher 24" Depth! 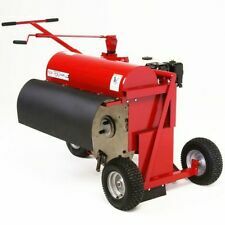 Model WPTR15HP600 -15HP 24" Gas Powered Trencher (Upgraded 27 Blade Model). 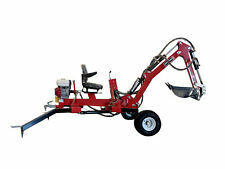 The Trenchers slim design fits through narrow gates and doorways, and allows trenching close to walls and fences. This trenching machine's dependable 9 HP Honda GX270 industrial engine powers the hefty hydraulic pump that lets you dig down to an 8 ft. depth with the included 2-tooth trencher bucket while you sit comfortably on the padded seat. Skid Steer Trencher: Eterra 4’ Trencher. Eterra Trencher 4 Ft. 30% are dirt teeth, which allow you to move more dirt out of the trench. Skid Steer Solutions, Inc.s Limited Product Warranty. Skid Steer Solutions, Inc.s Refurbished Product Warranty. SIZE : 26x12.00-12 8Ply Galaxy Super Trencher Tire I-3. Check the tire that you are replacing. For example, if your current tire is a 2PR, you can replace it with a 2PR or 4PR tire. TIRE WIDTH : 12.00. Also can be used. And Bradco Machines. Chain Trenchers. SIZE : 31x15.5-15 8Ply Galaxy Super Trencher Tire I-3. TREAD TYPE : Super Trencher. Check the tire that you are replacing. For example, if your current tire is a 2PR, you can replace it with a 2PR or 4PR tire. Chisel Nose. DIRT TOOTH. 15T50 Series Holders. Also can be used. And Bradco Machines. 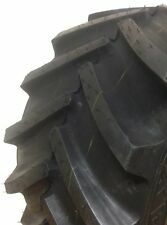 4.80 x 4.00 - 8, 2-Ply Tractor Tire for Tractor, Trencher. SIZE : 18x9.50-8 2Ply Tractor Tire. TREAD TYPE : Tractor. Check the tire that you are replacing. For example, if your current tire is a 2PR, you can replace it with a 2PR or 4PR tire. TIRE WIDTH : 9.50. Plans to build the Super Scooper. The dirt is hand shoveled into the buckets and travels up the scooper and is automatically dumped into a wheel barrow, truck, or trailer. Can be built to whatever size you need. Little Beaver Kwik-Trench blades teeth kits for model KT200B. Little Beaver Model KTR022. This part is NOS. FREE Trial ! JOHN DEERE . JOHN DEERE # CTM4509 (01MAR93) . COVERS THE FOLLOWING JOHN DEERE MODELS COMPONENT TECHNICAL MANUAL . FRONT WHEEL DRIVE AXLES. MANUAL IS IN VERY GOOD CONDITION . THIS MANUAL. BEFOREPURCHASING TO MAKE SURE IT COVERS YOUR VEHICLE. TEAMMATE II. INBOARD PLANETARY AXLES. JOHN DEERE . JOHN DEERE # CTM43 (09JAN98) . COVERS THE FOLLOWING JOHN DEERE MODELS COMPONENT TECHNICAL MANUAL . MANUAL IS IN VERY GOOD/GOOD CONDITION . THIS MANUAL. Little Beaver Kwik-Trench Powerband V-Belt. Little Beaver Kwik-Trench Powerband V-Belt fits all current models from 1996 and up. Little Beaver Model KT4-3V300B. MODEL: RT100. YEAR: 2007. TIRES: 18X9.50-8. TRENCH WIDTH 4"-6". MAX DIG DEPTH 3'. 42" SHARK CHAIN. HYDROSTATIC TRANSMISSION.